Home construction remains frustratingly slow, even with the long-expected tailwind associated with the transition of the Millennial generation into their key home-buying years. It has become apparent to most housing market observers that a slew of supply-side constraints are conspiring to reduce the pace of new home production. The most obvious constraint is a shortage of labor throughout the home construction supply chain, particularly among framers and remodeling contractors. Other constraints are: (1) a shortage of prepped lots; (2) a higher degree of industry concentration in some markets that has allowed some major builders to maintain high margins by restricting supply; and (3) an increase in regulation that has made it more difficult for builders to build affordable homes profitably. Some observers are not convinced that the recent slump in home construction is supply-driven at all. A recent Wall Street Journal article quoted a prominent housing economist—Doug Duncan, chief economist at Fannie Mae—as asserting that “It’s a late-cycle economy.” Slowing sales “happen in housing before there’s a downturn.” We disagree for a couple of reasons. First, since we see little evidence that a recession is on the horizon (unless the Fed loses its mind and ratchets up interest rates), it is not clear that we are in a late-cycle economy. Second, this cycle has been highly atypical with regard to residential construction. The large majority of “earlycycle” economies are accompanied by residential construction booms. Housing starts remained moribund in the early days of the current cycle. Thus far, the current cyclical peak in housing starts was 1.248M starts in 2016Q4—a level not far off the trough in previous recessions. The U.S. residential housing market is clearly underbuilt by a variety of measures. For starters, low inventories simply are not triggering new home supply as one would expect. As shown in GRAPH 1, existing home inventories stand at just a 4.2-month supply (at current sales rates), and yet housing starts have failed to breach 1.2M units (seasonally-adjusted at an annual rate) in recent quarters. By contrast, the last time inventories were this tight, U.S. housing starts were about 70% higher. For years, FEA has illustrated the U.S. supply shortage by showing the ratio of housing starts to population going all the way back to 1920. Home-building remains near recessionary levels by this metric. In this Spotlight, we want to illustrate developments at a local Metropolitan Statistical Area (MSA) level, so we need to modify our choice of metric. 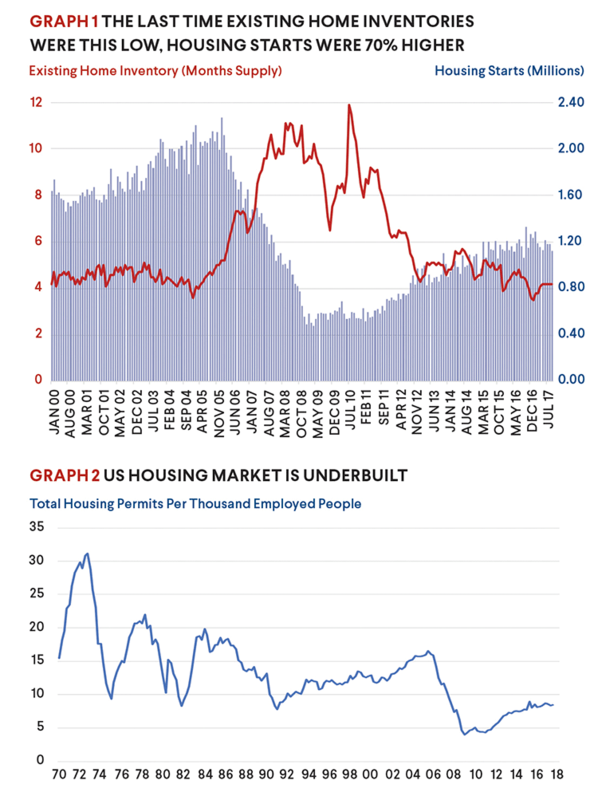 We chose the ratio of housing permits to employment because that is where the available data led us. Housing starts are not available at an MSA level, but housing permits are. Population data is available at an MSA level, but only at an annual level. A glance at GRAPH 2 shows that our chosen metric is just as useful as the housing start-to-population metric for showing the extent of underbuilding of homes in the U.S. on a national basis. While the economy did shed 7.7M jobs from 2008-2010, it has added a whopping 15.3M jobs since 2011 and the response from builders has been anemic. Seven years into the economic cycle, the ratio of housing permits to employment remains below the levels associated with previous recessions. Does home construction follow job creation? In the very early days of the recovery, clients would frequently ask where the new homes would be built when the economy recovers. We usually advised them to follow the jobs. In recent years, it has become clear that the arrow of causality runs in two directions. Let’s compare California and Texas. California has fared well with regard to job creation. Since the start of 2011, California has added 2.46M jobs—a 17% increase. This one state accounted for a third of U.S. jobs created since 2011. Over this same period though, California accounted for only 8% of total U.S. housing starts and 6% of U.S. single-family starts. By contrast, Texas has added only 712K new jobs since 2011, but has accounted for 15% of housing starts. California has a high regulatory burden and other costs associated with new housing. It simply is not easy to build affordable housing there—particularly single-family housing. This has created a severe supply shortage which has pushed up prices and made housing unaffordable for a wide swath of the population. According to Zillow, the median value of a home in California was $469.3K, compared to a median household income of $67.7K per year (2016 data). By contrast, the median value of a home in the U.S. is $202.7K, compared to a median household income of $57.6K per year. Texas is even cheaper than the U.S. as a whole. The median home value there is $159.0K, with a median income of $57.0K per year. California is not the only section of the U.S. that is failing to satisfy a burgeoning demand for housing. The problem is endemic in high-cost areas on both coasts for a variety of reasons. Most obviously, development in coastal cities can only occur in semi-circles (limited by water), in contrast to most inland areas where development occurs in full circles around the center city. Of course, different political cultures in the South have resulted in a more building-friendly regulatory framework than we see in the major coastal cities. Just as policymakers need to figure out how to facilitate the construction of affordable housing in the expensive coastal areas, it also seems obvious that employment will continue to shift to more affordable areas. The pending Amazon decision to locate a second headquarters away from high-cost Seattle could prove to be a bellwether in this regard. We would be surprised if Amazon were to choose another high-cost coastal area for its second headquarters. Bottom Line: U.S. home construction is vastly underbuilt by historical standards. Rapidly rising home prices have failed to elicit the sort of supply-side building boom that occurred in the late 1990s and early 2000s. The supply crush is national in scope, but most acute in coastal cities.